"Landscape design" sounds rather imposing. To be sure, one could spend years studying all the ideas in this field. But what about the DIY'er who wants to give a front yard a makeover or wishes to tinker with designing a garden? Do you need to spruce up the yard of a house you're selling? Do you simply want to enjoy an enhanced beauty in the privacy of your backyard? Ever wonder about the secrets underlying the magic art of the landscape designer? Well, the resource linked to above translates that "magic," making it understandable for the do-it-yourselfer. Study these photos illustrating landscape design ideas and learn about the concepts the pros employ. Whenever you put something together yourself, you are engaged in designing, however, humble the project. Sometimes we take our designing skills for granted, because what we're putting together is so commonplace for us that we are no longer conscious of the designing process. For instance, you are employing designing techniques when you compose a letter to send to somebody. Your basic "elements" to accomplish such a task include vocabulary, spelling and grammar. Somewhat more complex elements, or "principles," build directly on the basic elements. Letter-writing principles include conveying your ideas clearly and coming across as a courteous, intelligent individual. Your success with these principles will largely determine whether or not your letter achieves its ultimate objective. And so it is with landscape design. Do-it-yourselfers must first learn the basic designing elements that underlie the discipline of landscape design. These fundamental elements will then serve as building blocks for learning and implementing the more advanced principles for designing a garden in the backyard. These tried and true principles are the cornerstones of the world's picture-perfect gardens. Color, as defined by color theory. These five elements must be considered in designing both the hardscape and softscape of your property, the latter consisting mainly of gardens, lawns, shrubs and trees. I discuss form, line and texture in this article. I explain the use of color in my article on color theory. As for scale, it is simply the size of one component relative to adjacent components. You may wonder what seemingly abstract terms like "form" have to do with backyard landscape design. You may object that you're not painting a landscape, after all; you're just putting plants in the ground. Yet it is not coincidental that backyard landscape design shares some terminology with the world of art. The backyard is your canvas; your landscape design skills will determine the beauty of the resulting picture. The element of form is defined as the shape of a plant and the structure of its branching pattern. For a picture illustrating form, see Page 1. Trees come in many shapes (especially if pruned), including columnar and globular shapes. Likewise, tree forms range structurally from having the stiffly upright branches of Lombardy poplar trees to the droopy quality of a weeping willow. The form of individual components of a plant also needs to be considered. For example, the leaf form of one type of tree can be very different from that of another type of tree. Relative leaf size, meanwhile, helps determine plant texture (see picture). Since the texture is primarily a visual matter in landscape design, we often rely on the relative size of a plant's leaves to draw conclusions about its perceived texture. Yes, plant texture is highly relative: it refers to how the surface of the object is perceived, relative to the objects around it. Thus the plant texture of one bedding plant, for example, might be considered more or less coarse than that of an adjacent plant, due to differences in leaf size. The line refers to the fact that the viewer's eye movement or flow can be governed by the arrangement of plants and their borders. Eye movement is unconsciously influenced by the way plant groupings fit or flow together, both on the horizontal and vertical planes. Enough about the basic elements, you say? Good: let's move on to the principles you'll apply to your backyard landscape design. Because the effective application of these principles in your own backyard can raise the value of your real estate significantly. With the basic elements defined, it is time to put them to practical use. In planning a landscape design it is necessary to work with the "principles" that stem directly from the basic elements. How effectively you implement these principles will determine the impact of your landscaping upon the viewer -- be it yourself or a prospective buyer. Since this introduction to backyard landscape design is meant as a practical guide, the goal is not to provide abstract definitions, but examples that the do-it-yourselfer can implement immediately in a backyard landscape design. Three principles of garden design apply to the overall "feel" of the landscape: namely, proportion, transition and unity. Landscape plants should be arranged so as to conform to these principles. Proportion is the sense that the size of the individual components (the landscape plants) or groups of components in a landscape is consistent with the landscape as a whole. In other words, the idea behind proportion is very similar to that behind the basic element, scale. But the difference is that, while "scale" is a neutral term, "proportion" is based on the premise that something is either "in proportion" or "out of proportion." A garden design that is out of proportion is one that is marred by abrupt transitions or by the lack of transition. For instance, a five-foot-high stone wall might elegantly set off a large home but would make a small home look all the smaller. The landscaping of the latter suffers from a lack of transition: the height of the wall is too close to that of the house. Transition, simply put, refers to gradual change. Conforming to a sense of proportion is, in turn, one characteristic of a landscape or garden design that exhibits unity. Unity, or "harmony," has been achieved when the viewer senses that all the landscape plants in a garden design complement each other and have been chosen with one over-arching theme in mind. The placement of landscape plants in a thoughtful manner regarding their form is one method for promoting a unified feel. For instance, small trees flanking a driveway or an entrance should have the same form. Repetition also promotes unity. Like all good things, however, unity can be pushed too far. Introduce some variety, or "contrast" into a landscape, too. One way is through the use of landscape plants that vary in texture. The element, texture, is subtle enough that it can be employed to inject variety into a garden design without destroying unity. The next triad of principles for home landscape design, like proportion, transition, and unity, are interrelated: namely, rhythm, balance, and focalization. They all pertain to controlling a viewer's eye movement. Rhythm, in general, is the patterned repetition of a motif. In your home landscape design, the motif could consist of the landscaping plants used, for instance. Landscaping plants of one type could be planted in a row or hedge, effectively channeling the viewer's gaze in one direction, rather than another. The essential element here is line, since nothing controls eye movement more readily than a straight line. The objective of utilizing such a motif is to direct eye movement, unconsciously, in a manner that is most conducive to appreciating the home landscape design in question. For instance, perhaps the situation of your land holds the potential for a magnificent vista, but your current home landscape design does not take full advantage of it. Or perhaps you have a piece of statuary in your front yard that you want to show off. But if your front yard is full of other interesting items, it might be too "busy" for that item to receive sufficient focus. These and other problems of rhythm can be solved through an understanding of balance and focalization. Balance refers to consistency of visual attraction and applies to all five of the basic elements: consistency with form, with texture, etc. Understanding balance is, in turn, important for an understanding of focalization. Focalization is the forcing of the viewer’s perspective to a focal point. While it can be achieved through various means, more intense focalization is created through the use of balanced, consistent arrangements of elements. Let's return, then, to the two problems of home landscape design introjected above. The first is a problem of framing and can be solved by using bold, straight lines. In the photo on Page 3, for instance, a wall serves this purpose (a row of trees could also have been used). The second, a problem of drawing attention to one component in a busy front yard, could be solved by reducing clutter, opting instead for a minimalist style; and through the use either of color or of line. The statue could be surrounded with color that would direct the viewer's eye (focalization) unconsciously to that area. Using landscaping plants with flowers that are red or yellow en masse would do the trick nicely. So would an appropriate use of line. 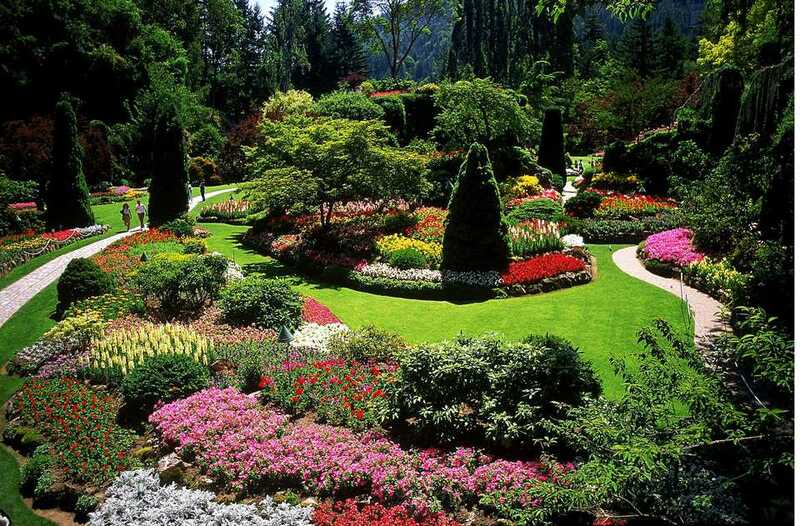 For instance, a straight path of paving stones leading up to the statuary, or bedding plants arranged so as to form a straight edging that will focus the viewer's gaze in the intended direction. It will be seen from the foregoing discussion that the principles of home landscape design refer to nothing more ethereal than simply arranging the landscaping plants selected in combinations that bespeak a well-reasoned plan. While not pretending to be an exhaustive discussion, the above examples should nonetheless serve to allay the do-it-yourselfer's fears that home landscape design is the exclusive province of wizards with unfathomable powers. Home landscape design is the province not of wizardry, but of planning, problem-solving and a "principled" approach.